Ever since I was a kid, I've attempted to plan out as much of the unknown as possible. My brain has always consisted of little pockets of time and I still spend a sick amount of energy perfecting the flow of activities that go in those pockets. I was the kid with the clipboard at the zoo planning each animal viewing to the minute. Other kids would ask if I'm working on a project for school and I would turn red with embarrassment. "No....it's....fun," and they'd stare at me for longer than comfortable and back away. I'm good at planning. It makes me feel comfortable in ambiguity. It gives me the illusion of control. And I've perfected pretending I'm having a sweet time in the middle of it all getting ruined. You know that whole spontaneous idea of "let's just figure it out on the road?" Makes me physically ill. But I'm like oh whatever, yeah sure that sounds great mostly. Except when it comes to food. Food crawls majorly bum me out. Restaurants are terrifying. I wish I could be that person that walks into a restaurant and doesn't start immediately thinking about what to do. Should I give my first or last name? Are there any Sarah-looking people in the lobby? Where do you stand so you can hear the cackle of your name when it's called? Are these people trying to cut in LINE?! It doesn't ever stop. What's worse? A restaurant out of town without a layout or directional sign to the bathroom or a heads up on the menu or a "people will stare if you wear your jacket with a faux fur collar" sign. IT'S FROM TARGET. Relax. Insert Winter Hike Weekend. Comfortably sitting on the Saturday end of MLK Day, we've been going to southern Ohio for three years now to stay in a cabin in the woods, get up with the roosters (yes there are roosters) and hike 6.5 miles in the dead of winter. It gets you out of your brain, makes you cough up all that indoor dust and gives you a reason to have way too many stocking cap options. It's quite lovely. This year, we finished the hike in good time and took glorious nap in our weird country cabin named "Cuddles." Then: ham squares. Predictable beautiful salad accessory. I earned them this year. After many years of driving around the entire Hocking Hills area looking for a good restaurant that wasn't too intimidating and lots of Internet research, we landed on a little gem we shall call PONDEROSA. Yes. It was too good to be true. No rules. Just pay first and here is all the food. And ham squares. They have tiny ham squares at the salad bar. Ham squares became just as exciting as the winter hike itself. And it is okay to look like a hobo who has just hiked then napped on her tired hiking face. Our 30 minute drive to civilization was excruciating so I started to talk about Oatmeal (duh). "How do you feel about taxidermy?" "What?? It's not THAT ridiculous." It was there, in a tired abandoned parking lot, that Ham Squares, also known as Ponderosa, sat dark and empty. We drove around the rest of the main road, which mainly consisted of me making up reasons why that one didn't work or I wasn't in the mood for this. I was just terrified and tired of learning another set of ways not to look like a clown in a public place. We settled on Golden Corral. People stared at my faux fur collar coat and I wanted to yell at them that I got it at Target. I was dressing for ham squares anyway! And they didn't have ham squares. Their salad accessories were sad at best. Squishy cucumbers, lumpy bacon bits, wilting lettuce. Just, gross. They did conveniently house cheese sauce next to every vegetable (nacho cheese, forgive me). It all tasted the same, disappointing and trans-fatty. But I got out alive and I didn't have to figure out where the bathroom was. And by Sunday, I was desperate for actual food not covered in goo. So I did it. I silenced my brain-scheduling pockets and went to a random restaurant for lunch. It was called Four Reasons and if it wasn't for me desperately needing coffee, I would've chickened out. Also, I needed coffee. The menu was located on the wall which meant you ordered there. "But can I get that with just meat and cheese?" "Like no vegetables or mustard?" "So you don't want, green peppers, onions, tomatoes, lettuce, mustard or olives?" I laughed nervously. This wasn't going well. We have offended her vegetables. I ordered an almond latte (I wanted soy but I didn't know if I was allowed to apply that word to coffee in this county of Ohio) and a chicken salad croissant. Then she handed us a plastic banana. I looked at the cashier and just stared. Weird. And hilarious. We sat by three silent elderly old couples munching on salads. They didn't bother looking up as we walked by. The walls were exposed brick and they were playing jazz flute on the radio. An older lady with a ton of volume in her hair came trotting out with two plates. "Chicken salad....and a sandwich with everything off it. Just like my sons like it!" She laughed, took the plastic banana and walked away. She didn't even look at my faux fur collar. 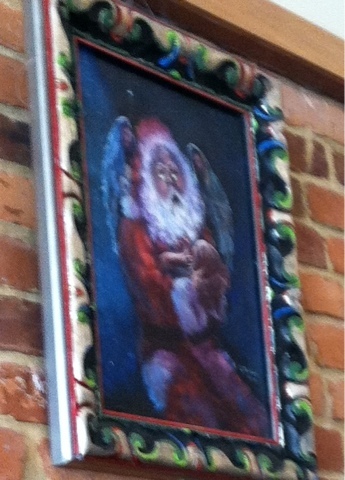 A Santa holding a baby with two angels peering over each of his shoulders. There, in that painting, it occurred to me that this place was weirder than I could ever be. Even if I accidentally walked into the kitchen while trying to find the bathroom, everyone would be staring at the Santa baby angels so they wouldn't even notice. What an incredible thing. I was relieved to be home. I even smiled at the sight of our duplex. It's tall and white and I call it the "mayo jar" and above all adventure, surprises, good, bad and anxious, my happy place is the moment in the afternoon when Paul is bleaching the crap out of the bathroom and Oatmeal is squeaking for more peppers and I am making sure all of the water bottles in the fridge are facing out. But sometimes you learn when you're starving and need coffee in southern Ohio, there's a place weirder than you that can make you feel okay, too. And the key is to forgive yourself for not knowing where the bathroom is, for not figuring everything out before lunch is over because no one can. No one really knows what in the world we're doing. And maybe that's okay? And if you just got scared of going to new places all the time, no one would ever be able to give you a plastic banana to hold. And that is just sad.